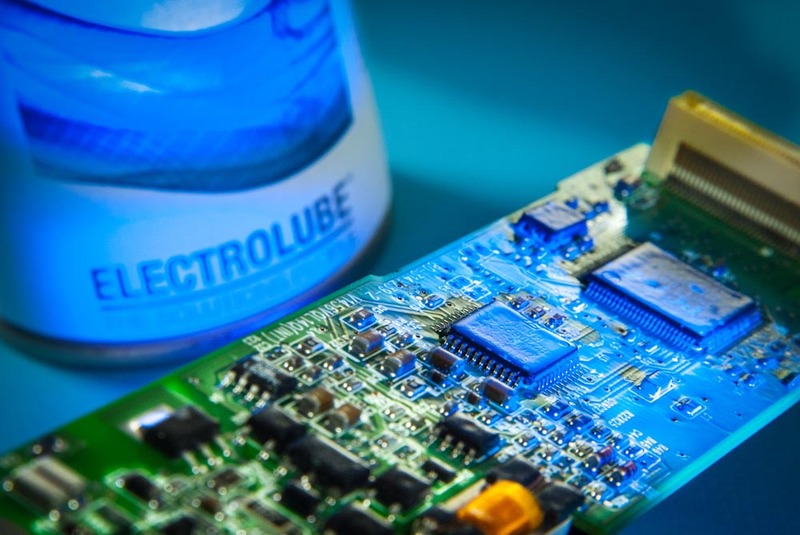 Electrolube will demonstrate its technical prowess in specialist electro-chemicals with a selection of new conformal coatings and encapsulation resins that will make their debut at productronica 2017. Two brand new products to Electrolube’s innovative two-part (2K) Conformal Coatings series, include the 2K350 and 2K550 polyurethane coatings. 2K350 is a solvent-free coating which is opaque blue for ease of inspection. The UL94V-0 compliant coating is highly flexible and effectively combines the protection and properties of an encapsulation resin, with the ease of a coating application. 2K350 has an operating range of -40 to +130°C and provides excellent coverage, even in tight spaces, while its extreme flexibility offers protection even around delicate components. The hydrophobic coating gives excellent water immersion, salt mist and humidity protection, making it an excellent choice for automotive electronics. The new 2K550 is a tough, flexible, high performance coating, which also provides the protection of a resin with the ease of application of a conformal coating. The UL94V-0 compliant coating is characterised by greater coating thickness and enhanced edge coverage and shows improved adhesion, hardness and scratch resistance. 2K550 has excellent clarity and resistance to discolouration, humidity and condensation. The new coating also features a fluorescent trace to aid inspection. HFAC is an additional product launch from Electrolube and provides an alternative solution for manufacturers who require a coating without the use of aromatic solvents or chlorinated and brominated flame retardants. For specific customer applications, HFAC will entirely eliminate the negative issues associated with halogenated materials and issues with aromatic solvents, making it safer for operators. HFAC is flexible and transparent with improved flame retardancy, good clarity and excellent UV resistance, making it suitable for use in LED applications. 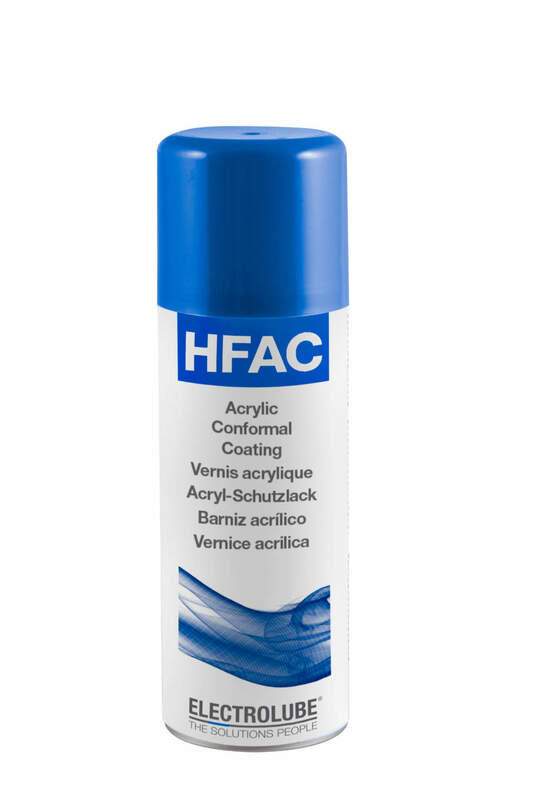 The UL94 V0 approved HFAC is a versatile coating which can be sprayed, dipped or brushed. The coating can also be easily removed for rework. Two new optically clear polyurethane resins – UR5640 and UR5641 – offer ‘water white’ transparency, making them ideal for encapsulating LED luminaires. UR5640 cures to provide a flexible, protective and aesthetically pleasing covering over the luminaire elements, and the aliphatic chemical nature of the cured resin is naturally resistant to the yellowing effects of UV light, making it useful for a range of outdoor applications. UR5640 is also scratch resistant and offers high resistance to weather, acids and alkalis, water and mould growth. UR5641 has similar optical properties to UR5640 but with the added bonus of being flame-retardant and eminently suitable for the protection of LED luminaires exposed to hazardous atmospheres, such as emergency lighting, or lighting intended for installation in ATEX rated/zoned environments. 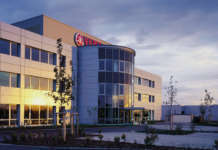 The resin’s halogen free aliphatic chemistry ensures resistance to the yellowing effects of UV light, again making it useful for both exterior as well as interior applications. The third resin to be launched by Electrolube at this year’s productronica is the ER2225 RoHS-2 compliant, black epoxy potting compound, formulated to meet the exacting requirements of the automotive sector and other industrial applications that require high temperature resistance, good thermal cycling performance and the ability to withstand attack from a wide range of chemicals, fuels and aggressive fluids. ER2225 can be used to encapsulate electronic assemblies and PCBs subject to an operating temperature range of -40 to +180 °C; ER2225 will even tolerate short excursions of up to +210°C. The resin shows good thermal conductivity (1.1W/m.K), making it suitable for industrial applications requiring good heat transfer across a wide temperature range. 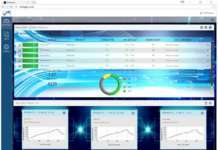 While ER2225 does contain fillers, in tests the resin shows excellent flow around components and is easy to process in a fast-moving production environment.